In our last Nubble post, we mentioned that he and his puppy raisers were going to Ocean City. Everyone had a blast! The drive down was very uneventful - which is a good thing! It means that Nubble has very good behavior in the car. Although, his puppy raiser is glad that she drives a minivan, because Nubble is just too big to fit comfortably in a Volkswagen Beetle or a Mini Cooper! Once they arrived, Nubble settled right into his new environment. He had no problem sleeping in a temporary home - no barking at all! Nubble went on lots of walks during his weekend at the beach. Because dogs aren't usually allowed on the beach at Ocean City, Donna and her family checked in with the lifeguards so they would know that Nubble is a service dog-in-training. The lifeguards were very nice, welcoming him onto the beach. Nubble went for his walks early in the morning to avoid the hot sun and sand. 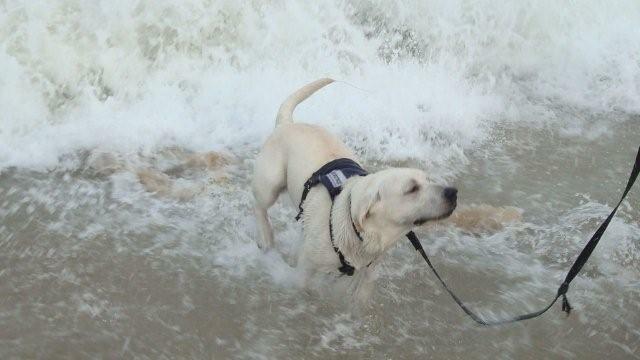 He loved the waves! Donna put him on a six-foot leash, and all Nubble wanted to do was swim! He kept splashing over and under the waves and running in circles. As they were walking down the beach, Donna's feet kicked up little puffs of sand in the water. Nubble tried to pounce on this strange thing until he figured out it was just sand. He also liked the seagulls. He didn't chase them, but he did stare intensely at them. The sandpipers were a little different. Donna used the sandpipers to practice leave it with Nubble. By the end of each day, he had sand, sand, and more sand in his fur. His puppy raisers hosed him off outside, and even though he wasn't too keen on the cold hose water at first, he soon settled down and got some good practice standing still while his puppy raisers rinsed him off. He encountered several dogs that weekend and behaved fairly well. He's still working on the concept that not all dogs are play things, though. When he and his puppy raisers were walking on the Rehoboth Beach boardwalk, another dog came up behind them. Because it was behind them, Donna didn't notice it, but Nubble sure did! He tried to jump for the dog and almost knocked Donna over. When they came across the same dog later, though, Nubble completely ignored him. Donna has learned that she needs to be extremely alert to everything in the environment and to keep Nubble focused on her if there is any chance that he might bolt. The boardwalk was also great exposure for Nubble because he was around so many people. He took a little while to settle, but once he did, he did great. Whenever Nubble goes somewhere, he always needs a few minutes to settle in, but once he does, he's able to get down to business and work. Later on the boardwalk, he got to enjoy an ice cream cone. Even though he has only had ice cream cones twice before, he knew exactly what was coming when he saw that Donna's kids had ice cream cones. He loves this tasty treat! They had the opportunity to practice stairs again. Because stairs are so challenging for Nubble, Donna takes every opportunity she can get to practice going up and down stairs with him. He still wants to rush up stairs, and it's difficult to get him to go slowly, but he does go up the stairs now. While they were practicing, though, Nubble backed out of his collar! 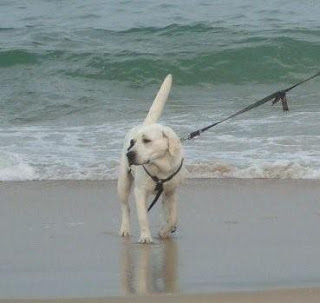 Luckily, he headed for the beach. Then his recall kicked in, and he came back to Donna when she called him. He went to Grotto Pizza with his puppy raisers, and did a fantastic job! He did under, and laid under the table for most of the time. He did try visit (putting his head in Donna' s lap) to get attention, but soon he figured out that it was time to relax under the table, and he settled down. Donna was able to eat with the leash nice and loose because Nubble was doing so well. Nubble does extremely well with certain cues. On the last day, his puppy raisers packed up and put his crate in the car. Then, while they were in the condo, Donna's kids gave Nubble the kennel cue, which is the cue for him to go into his crate. Well, even though his crate was packed away in the car, he knew what to do. He went right over to the spot where his crate had been all weekend and laid down! Back home, Nubble's water adventures weren't over. The Northeast Division went on an outing at the lake at Bear Creek Camp. Wow, did the dogs have fun! Nubble swam with his buddy SSD Graham. 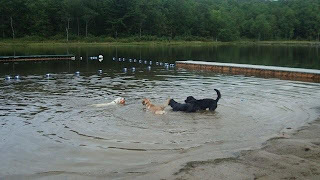 These two dogs' swimming styles couldn't be more different! Nubble swims with his head close to the water, while Graham looks like he's swimming standing straight up! All of the dogs - Nubble, Graham, Slate and Sky - played a lot of fetch. Naturally, they all slept well that night! Graham's puppy raiser is now raising SSD Burnaby, one of our new puppies from Pacific Assistance Dog Society. Nubble had a chance to meet this little black lab, and she is probably the youngest puppy Nubble has ever met. At first, he did well greeting her, but then all of the dogs got to be too much for him so Donna took Nubble away from all the distractions to calm down. Then, taking their time, they tried greeting Burnaby again. They let Burnaby come to Nubble and made sure he didn't try to rush at her. By the end of the greeting, Nubble was making great progress in how to properly greet a young dog. Nubble had his evaluation, and he is doing very well for his age. (He's now eleven months old!) The evaluation helped Donna identify areas where Nubble needs some practice and areas where he's doing well. We'll have more about Nubble soon! Tonight, the Gemstones puppies are joining their puppy raisers! Taz, Aqua, Topaz and Opal will don their purple SSD service dog-in-training harnesses and begin learning the skills they'll need to assist their future partners. You've probably noticed that there are a few puppies missing from that list. Amber has traveled to Pacific Assistance Dogs Society (PADS), where she'll join their program. The Gemstones' mother, SSD Pearl, originally came from PADS, and we have an agreement with them to exchange puppies. But what about Coral and Diamond? We believe that Coral and Diamond will be much happier as beloved family pets than as service dogs, so we have released both puppies from our program. Not every dog is suited to service dog work, even though they may be wonderful dogs. (And Coral and Diamond are definitely sweethearts!) When puppies come to the kennel before they're placed with their puppy raisers, they go through temperament testing to make sure that life as a service dog is a good fit for them. In this test, we look at 40 different traits in the puppies. Dogs that will be most successful and happiest in our service dog program have a moderate amount of energy, and they display confidence in a variety of different situations. During the test, the puppies are exposed to different surfaces, sights, sounds, loud noises, things they can chase and retrieve, and other dogs. We look for puppies who recover quickly when startled or excited. A dog will undoubtedly encounter things that startle or excite him, but it's the dog that can recover quickly and refocus that will make a good service dog. We also dress the puppies in their harnesses and watch their reactions, and look at how well the puppies cooperate with their handlers during the test. A puppy that wants to do what its handler asks will have a greater chance of success as a service dog than a puppy who would rather investigate all of the interesting distractions. This temperament test gives us a fairly clear picture of each puppy's personality and helps us decide whether service dog work is right for that dog. For Coral and Diamond, service dog work might not be a life that makes them happy and is best for them. When we release a dog from our program, we find permanent homes for them where they will be happy and loved. We're currently looking for forever homes for Coral and Diamond, and we're sure that they will be very happy with their new families. Each Gemstone is moving on to the next stage of their lives. For Coral and Diamond, they're heading toward lives as beloved family pets. 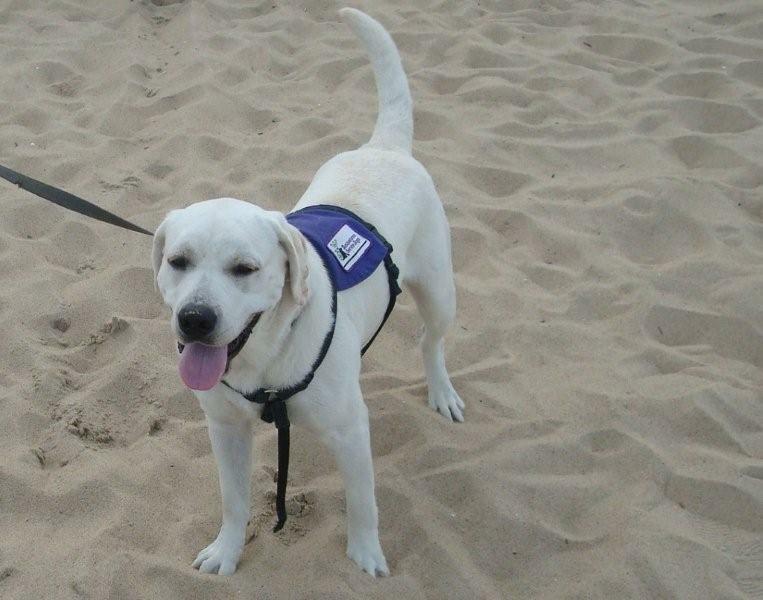 For Amber, she's embarking on her service dog journey with Pacific Assistance Dogs Society. And for Taz, Opal, Aqua and Topaz, they're beginning their journey as Susquehanna Service Dogs, learning to change lives.